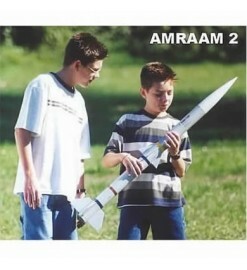 > ROCKET KITS>High Power Rockets>Rocket kit Amraam 2 - Public Missiles Ltd.
By popular request, here"s a smaller version of the very popular AMRAAM-3 and AMRAAM-4 kits! The AMRAAM-2 is designed specifically for flyers that want the great flights and military styling of the AMRAAM, but for smaller flying fields, smaller motors, or smaller budgets. It"s great for your first bigger bird, introducing a youngster or B.A.R. to higher-power rocketry, or when you want to wow "em with those great F and G motor flights on a smaller flying field. Priced right for your budget, but with PML design, quality, and standard features built-in!